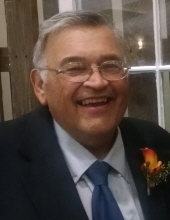 Jerry G. Sherrick, age 72, of Washington, Missouri, formerly of Sullivan, passed away Wednesday, January 30, 2019 at Barnes Jewish Hospital in St. Louis. Jerry was an avid sportsman and outdoorsman. He loved hunting elk, deer, and duck with his friends. He also enjoyed fishing, boating, and getting together for fish fry’s. Jerry was a diehard Cardinals fan, very rarely missing a game, and watching recorded games that he missed. He was an active member of the community of Sullivan. When the kids were little, he could be found coaching many sporting events for them. Jerry loved spending time with his grandchildren over the years. One of his favorite pastimes was “going for breakfast”. Those who knew Jerry know his love for people. Rarely did he meet a stranger and he was everyone’s buddy. He will be missed by many family and friends. Jerry is survived by his wife, Norma Sherrick of Washington, MO; his children, Dee Ann Klinckhardt and husband, Christopher, of St. Louis, MO, Todd Sherrick of Bourbon, MO, Tye Strauser and wife, Diane, of Washington, MO, Kevin Strauser and fiancée, Gulmira Kanayeva, of San Diego, CA, Stacey Dunker and husband, Bob, of New Haven, MO, and Chad Strauser and wife, Megan, of New Haven, MO; two brothers, Bob Sherrick and wife, Doris, of Peculiar, MO, and Jody Sherrick and wife, Crystal, of Fredericktown, MO; eleven grandchildren: Derek, Amanda, Ariel, Robert, Bryan, Brett, Chelsea, Jonathan, Wessley, Wyatt, and Aubrie; four great-grandchildren; a sister-in-law, Nancy Sherrick of Liberty, MO; and numerous nieces & nephews, other relatives and friends. Funeral services will be conducted 11:00 AM, Monday, February 4, 2019 at the Eaton Funeral Home in Sullivan, with Pastor Duncan Skiles officiating. Interment will be in I.O.O.F. Cemetery in Sullivan. Visitation will be held from 2:00 PM to 6:00 PM, Sunday, February 3, 2019 at the Eaton Funeral Home in Sullivan. To send flowers or a remembrance gift to the family of Jerry G. Sherrick, please visit our Tribute Store. "Email Address" would like to share the life celebration of Jerry G. Sherrick. Click on the "link" to go to share a favorite memory or leave a condolence message for the family.